When I heard that the 52nd Miss International Pageant would take place in Japan again, I was super disappointed because most of the Miss International Pageants that took place there have been super boring and totally outdated. When I heard that it would the whole thing would take place on the remote island of Okinawa, I had even less hope. As far as I was concerned, the remote islands of Okinawa was pretty much quiet, not really that urban, and without much to do. I had no idea how the delegates would be kept busy for 3 weeks. Having seen clips of previous finals in Japan, I really thought that it was going to be one of the most forgettable editions ever. 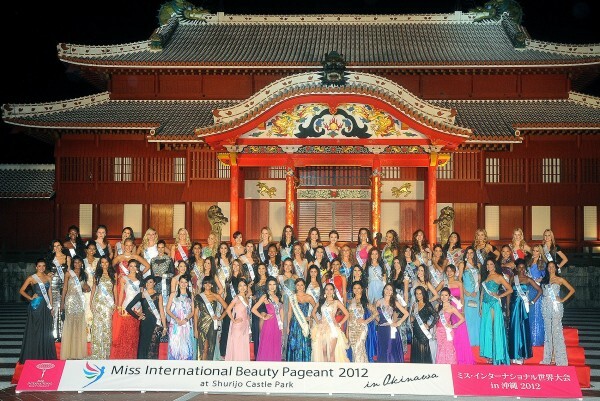 OKINAWA MAGIC: Okinawa was a very gracious host to the 69 beauties who competed for the Miss International title. Much to my surprise, I have to admit that Okinawa did a pretty amazing job at hosting this event. Activities were planned for almost every day that the girls were there and it seemed like the girls were treated really well. Events such as the National Costume Parade and the Governer's reception were really well done and the organizers showed that you don't need to stage an event in a bustling city to make it worthwhile and fun. The events seemed meaningful and were a true celebration of the Miss International's goal of promoting world peace, goodwill, and understanding. Okinawa put it's best foot forward and I applaud them as a wonderful host for this pageant. CELEBRATING CULTURE IN THE STREETS OF OKINAWA: The 69 delegates took part in a parade in their national costumes. 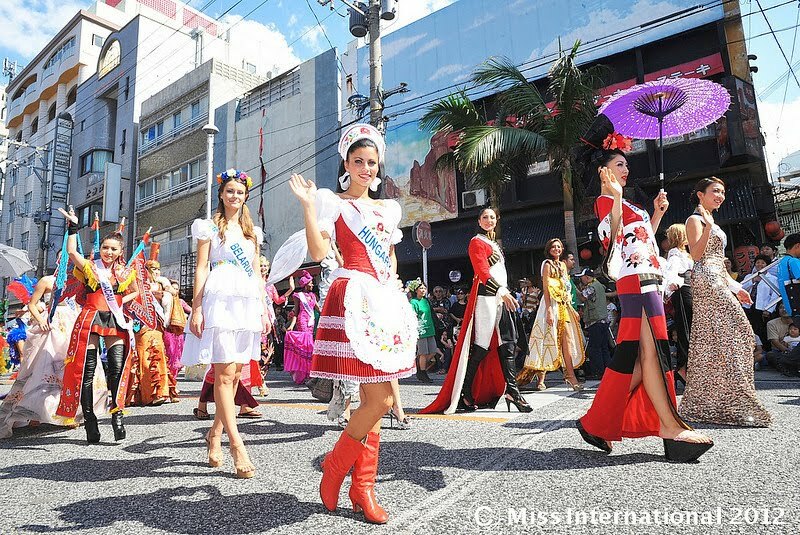 The goal of the Miss International Pageant is to promote world peace, goodwill, and cultural understanding. 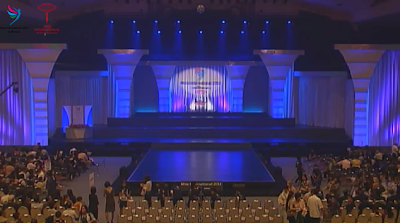 In terms of delegates, 2012 saw one of the highest number of delegates at this pageant. 69 delegates travelled to Okinawa to try and become the 52nd Miss International. Mega favorites were the delegates from Brazil, Paraguay, the UK, the Dominican Republic, Colombia, Venezuela, the Philippines, the USA, and Poland. In terms of the quality of the delegates, it was pretty much a mixed group. There was a small group of stunners (about 20 - 25 or so) and the rest were definitely average to sub-par. Nevertheless, the girls seemed to have fun and Miss International showed they can put on a good pageant without the help of China. 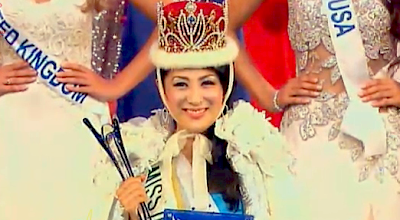 Speaking of which, due to the tension between China and Japan which was pretty much reaching boiling point at that time, China withdrew from this pageant. The delegates arrived at the beginning of October and about 3 weeks later on Sunday October 21, it was time for the live final. Major kudos should be given to the organizers for broadcasting the event on Ustream. It just goes to show that in these modern times, you can still show your event to the world without having major broadcasters on board. The final event was held at the Okinawa Prefectural Budokan Arena Building and after having seen the stages of other finals in Japan, I did not expect too much at all. So, I was pleasantly surprised that the stage actually looked quite modern and good. Now, don't get me wrong, it was not quite the stage that you would expect for a major international pageant, especially the 3rd oldest and most prestigious major pageant in the world. But I know that times are tough and Miss International has never been able to equal the interest or popularity of its two older and much more glamorous sisters, Miss World and Miss Universe. The show opened with an opening number reflecting Japanese culture and I quite liked it as the show was off to a great start. I even thought that the pageant would be much better than I had thought. Much to my surprise, there was even an English host which I did not expect as I thought that most of the show would be in Japanese. And that's about where it stops because the show went on... and on... and on.... and on.... and on.... and when you thought it could not go on much longer... it did! The entire thing lasted for about 5 hours and that is just way too long. No one loves pageants that much to endure 5 hours. The organizers will really have to find people who know how to put on a show to make the event more slick, modern, and definitely more compact. No pageant should be longer than 2 hours, or 2.5 hours at the very max. The beginning of the show was pretty much the best and from there on it was just downhill. Yes, it was nice to see all 69 compete in gown and swimsuit but the pace was so slow that it was a struggle to watch all 69 compete in swimsuit and gown... plus there were also some major problems with the signal and the live streaming which was very frustrating indeed. By the time all 69 delegates had paraded in swimwear and gowns, I was so irritated that I did not really even care about who won anymore. The drab entertainment that we saw on stage did not really do much to lift the mood. In fact, I had started wishing that I did not have to endure this kind of torture. I would state again: if the Miss International Organizers want their pageant to keep going, they need to definitely freshen up its imagine and completely modernize its image. I would gladly assist you in doing that if you can't find anyone else. the most pleasant surprises of the night. When the top 15 were announce it was a mix of the heavy favorites and a few pleasant surprises. Poland did not make it but she totally ruined her chances by choosing one of the most hideous gown I had ever seen on a pageant stage. Dominican Republic, Paraguay, Brazil (despite the weight gain), Colombia, India, Philippines, the UK, the USA, and Venezuela were all exptected to make it. I knew Japan would probably make it as they were hosting. In fact, I also thought that she would get a token top 5 spot just to envoke national pride even though I was not really too thrilled about the idea as I had seen much better girls from Japan competing over the years and most of them never even made the cut. Finland was quite a surprise. I thought she could do well at first but as the girls' time in Okinawa went on I kind of lost interest in her as she looked better in photoshopped photos. Sri Lanka was a great surprise. Miss International is known for their very pale line-up of finalists and ignoring darker beauties so I thought that she would probably be another stunner that was robbed. Might I also add that it was such a delight to see a black African (Miss Namibia) making the cut. She's probably only the 2nd or 3rd black African ever to make the cut. I was also really happy to see stunning Miss Haiti making. Overall, it was great to see the ICA finally appreciating the darker beauties and seeing plenty of "color" in that line-up. It would be nice to see this again for years to come. The top 15 had to make a speech each about why they should be Miss International. Once again, this seemed quite dragged out and it was done in an old fashion way. Then it was time for the judges to confer... now this, in my opinion, should never ever happen at an international pageant. We have amazing techonology for a reason. Judges don't have to discuss and argue about who will win. They need to give scores, the scores should be tabulated, and boom the results should be announced. Anyway, so it seemed like the judges had quite a debate about who they wanted. There were a few akward moments when the hosts had to try and entertain the crowd before informing them that the judges were still deliberating.... and it was very clear that the crowd was becoming restless. I am it was probably about 11pm in Okinawa and they had probably arrived around 4 or 5pm in the afternoon. 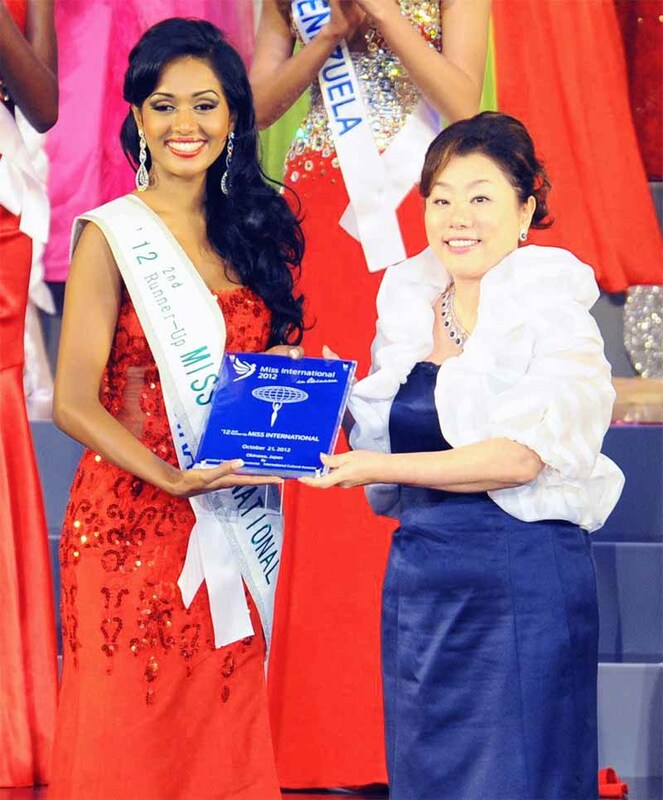 Miss International title holder, and Sri Lanka placed 3. Finally, the results were announced. I knew Paraguay was going to do well even though she was not exactly my cup of tea. She was in fifth place, gorgeous Miss Dominican Republic was fourth. She deserved it. I was shocked when Sri Lanka was named 2nd runner-up. But it was definitely amazing that her beauty was appreciated by the judges because she is absolutely stunning. Finland's first runner-up position was definitely a major surprise as I thought she had one of the least impressive speaches. But I guess the judges loved her natural beauty and down to earth personality. At this point I believed that the crown would go to Miss UK, or possibly Venezuela, the Philippines, or the USA. Then shock, horror... the winner was the home favorite, Miss Japan. I think it took me a few minutes to pick my jaw up from the ground. Winning Miss Photogenic was alreayd a stretch but winning the whole thing, that was just too much. It was a clear case of blind nationalism. The message boards started burning with messages of fury, ridicule, and disapproval. The Miss International Pageant which is owned by the ICA in Japan had never crowned one of their own in the 52 year history of the pageant. The fact that they did with one of their less impressive delegates was quite a disappointment. They have had some stunners in the past who were left clapping but suddently they got their win. It is just the timing that you could not help but notice. It was in the midst of Japanese tension with China. It was almost like the Japanese had to send a message to the Chinese: anything you can do, we can do too. Miss World was won by Miss China in China just two months before. So, the judges might have known this and decided to show their patriotism by finally crowning one of their own. The only problem is that compared to the stunner that won Miss World, this girl was like her demure wallflower cousin who no one would even notice if she stood next to the taller, sexier, more glamorous cousin. It's a shame, really. It's probably safe to say that Miss International will not be hosted by China for a few years to come, so if this is a smart move to at least ensure they find hosts in Japan if other countries don't show interest in hosting, then I guess all's fair in "business" and war.